And today we’re talking dry shampoo. Dry shampoos are such a popular product, it seems every hair care company has come up with their own version. They’re great for when you want to give your hair a clean look without having to actually wash it… Technically, letting your hair go a few days between washes it the best for maintaining color and shine, but nobody wants to walk around with limp, oily hair. And when you have fine hair like I do, that can happen before the end of the first day. So dry shampoos are the way to fake a shampoo. They are simply just powder in a spray can. The powder absorbs the oil and gives you back the volume you had just after you dried your freshly washed hair. One problem I have with the dry shampoos are that they come in such small cans. You can run through one of those in no time if you use it often…because the cans are filled with more air than powder. Dry shampoos don’t have to be expensive, there are plenty of fine drug store brands on the market but if you really wanna save money, or perhaps not spend any at all, I have the best tip for you. I’ve been using this product since junior high school and swear by it. 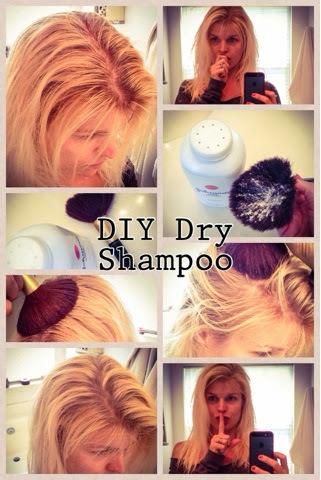 It works every time, is so easy to use, and gets the same result as any dry shampoo out there. What’s this secret, wonder product?! Plain, ordinary, white baby powder that you’ve probably had under your bathroom sink for ages is essentially dry shampoo without the spout. All you need is an extra large makeup brush and a bottle of baby powder and you’ve got yourself dry shampoo that will last you years and years. I even keep the travel sized baby powders and a small brush in my purse, gym bag, and travel toiletry kit so I can use it any time my hair looks a bit limp. And if you’re a brunette or red head, you can still use this trick without worrying about your hair looking like a Victorian wig. If you’re a brunette, just mix your baby powder with some cocoa powder until you get the right color (bonus-you’ll smell like a brownie). Redhead? Mix it with some of your bronzer (or cinnamon!!). I had red hair when I lived out in LA for a hot minute and used bronzer in my baby powder all the time. It worked like a charm! !